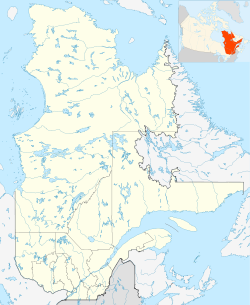 Trois-Rivières (French pronunciation: ​[tʁwa ʁivjɛʁ]) is a city in Quebec, Canada. It is where the Saint-Maurice and Saint Lawrence Rivers meet. It was first created on July 4, 1634. It was the second permanent settlement in New France, after Quebec City in 1608. The city's name is French for three rivers. It is called because the Saint-Maurice River, which is divided by two small islands at the river 's opening, has three mouths at the Saint Lawrence River. ↑ 2.0 2.1 "Census Profile — Trois-Rivières". Canada 2011 Census. Statistics Canada. 2012-02-08. Retrieved 24 May 2012. ↑ "Census Profile — Trois-Rivières, Population Centre". Canada 2011 Census. Statistics Canada. 2012-02-08. Retrieved 24 May 2012. ↑ 4.0 4.1 "Census Profile — Trois-Rivières, Census Metropolitan Area". Canada 2011 Census. Statistics Canada. 2012-02-08. Retrieved 24 May 2012. . The census metropolitan area consists of Trois-Rivières, Bécancour, Champlain, Saint-Luc-de-Vincennes, Saint-Maurice, Wôlinak, Yamachiche. In the 2006 census, the census metropolitan area had not included Saint-Luc-de-Vincennes or Yamachiche. Wikimedia Commons has media related to Trois-Rivières, Quebec. This page was last changed on 12 April 2019, at 14:13.